"Breakfast in Bedlam", with hosts Josef Princiotta and Merrill Mael, premiered on KTVA channel 11 in 1965. The show was broadcast live from 7:00am to 9:00am Monday through Friday. Back then, KTVA's studios were still located on the ground floor of the McKinley building, (now the McKinley Tower Apartments) located at 337 E. 4th Avenue in down town Anchorage. And because the 1964 Alaska earthquake had damaged the building, the only tenants remaining were KTVA channel 11, KNIK-FM and the occasional homeless person that would wander in off 4th avenue. Hosts Josef Princiotta and Merrill Mael were amazing. Merrill Mael began his broadcasting career back in 1939 at KEVR and KOL radio in Seattle. 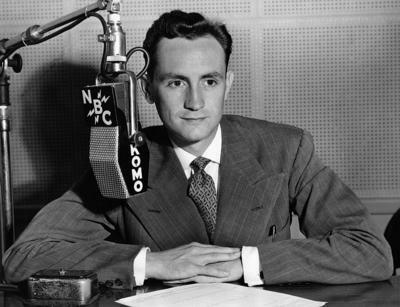 In 1941, Merrill was an announcer at NBC in Hollywood. When Merrill first came to Alaska he worked at KBYR, then KFQD. Josef Princiotta is and was a very accomplished artist and sculpture. Among his many accomplishments, Josef worked as an artist/animator on the short-lived NBC network television series "Turn On" produced by George Schlatter as a follow-up to his highly popular "Laugh in" show. Josef also created sculpture around Anchorage and did the 7 life size sculptures included in the side-walk marque, outside Caesar’s Palace in Las Vegas. So these two very talented men set out to wake up South central Alaska like never before. Their commercials were shot on black and white Polaroid film and during the show they shot around mirrors and through tubes to create unexpected images during their broadcast. I remember being in the studio during one broadcast when a black and white studio camera developed a "burn" where the image in front of the camera was "burned" into a white image, frozen on the camera. Josef had the camera on Merrill, and with the white image of Merrill burned onto the screen, Josef moved the camera to one side, so the audience was seeing both Merrill and his "burned" image on the screen at the same time. Merrill reacted by pointing to the studio monitor and saying "look, I'm beside myself." Hosts Josef Princiotta and Merrill Mael were not confined by the rules of television of that time. Some of their set-ups were amazing. Josef created a diorama using large sheet of black paper with dozens of pin holes in it and a plastic Gemini capsule model hung by a thread. The B&W studio camera gave the audience a live on location look. They used the sound that NASA had provided from a radio link with the capsule. Breakfast in Bedlam also used puppets that Josef created - A wolf, a frog, a gold miner, 3 birds and a moose. Besides creating puppets for Breakfast in Bedlam, Josef Princiotta also created the Mother Moose hand puppet and the Mother Moose costume for Larry and Carol Beck that would premiere on Anchorage TV screens on KTVA channel 11 some time after Breakfast in Bedlam. Always an artist, Josef also provided art lessons for the Breakfast in Bedlam audience. Using Herb Shaindlin as his model, Josef sculpted a bust of Herb in stages, during several shows. Other show features included Merrill Mael interviewing Anchorage movers and shakers and celebrities traveling to Anchorage. Merrill gave stability and humor in a style that played well against Josef. When KTVA finally moved out of it's 64' earthquake damaged studios and into their Spenard studios, Breakfast in Bedlam made the move too. But technology made it possible for the show to get a portable black and white video camera, tape machine and a van so they were able to shoot on location. But not just in and around Anchorage. Using 16mm film in a Bolex Camera and a Nagra tape recorder, Josef traveled to Russia in the summer of 1966, to film Man-On-The-Street interviews for the planned 1967 Alaska Purchase 100th. Anniversary. Also in 1966, I had gone to work at KTVA and was now a camera operator for Breakfast in Bedlam. And because Merrill Mael showed up every day to do the show in a white shirt and tie, I began wearing a white shirt and tie behind the camera. My style of work clothes soon became expected of all the television studio crew members. Josef and Merrill had offices across the street from the Westward hotel in down town Anchorage. And when the Beatles made their famous stop over in Anchorage, Josef went across the street to the hotel and interviewed the Beatles. As a parting gift, the fab four gave Josef an autographed Beatles album. The next morning, Josef and Merrill auctioned off the autographed Beatles album on Breakfast in Bedlam. When Breakfast in Bedlam had reached the end, KTVA started broadcasting a new live local program called "The Morning Show" hosted by Anchorage radio personality Roger Latham. The Morning show featured a popular segment called "The Trading Game" and also incorporated a lot of music and comedy. I was also a studio camera operator for that show and even created and starred in some sketch comedy for "The Morning Show". Roger Latham and I went on to co-host "The Varsity Show" teen dance program on KTVA channel 11. But nothing could ever touch the creative magic of Breakfast in Bedlam. A special thank you to Josef Princiotta for providing information and suggestions for this story. Thank you for sharing this amazing story. I love hearing about Anchorage back in the day. Our goal is to preserve all those wonderful Alaska memories before they are forgotten. Toward that, we encourage everyone with Alaska stories to post them here on Anchorage Memories.